I am one of those sock knitters who will openly and unabashedly admit that I usually have more than one sock WIP on the needles at any given time. Generally, I try to have at least one plain vanilla sock on the go (hey, I have a lot of self-striping yarn!! ), especially if I'm also working on a project that's a little more involved or complicated. Most of the time, I get too impatient and can't help but cast on a new sock project when I'm a cuff or a toe away from finishing the current sock. Well, this time was no different. 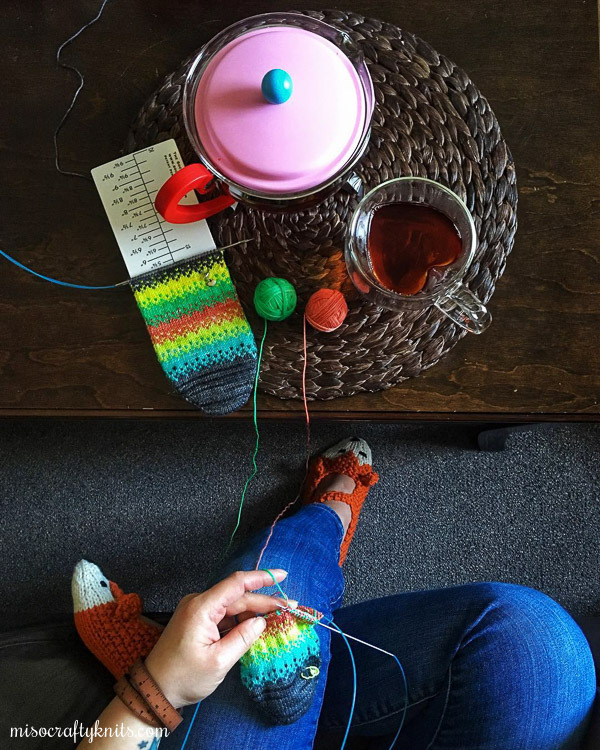 The second I had bound off the last stitch on my Rainbow Stripes Askewed socks I immediately started Pixel Rise by Kemper Wray. If you follow me on social media this is already old news! I've been wanting to knit this pattern ever since I spotted Kemper's pair on Instagram over a year ago. Then, I was super lucky to win her Instagram giveaway for both the pattern AND a Junk Yarn (which Kemper dyes) mini skein set put together exclusively for the pattern! I tempted to cast on the day the yarn arrived in my mailbox but held off because I didn't have the right colour yarn for the toes and cuffs in my stash. I was hoping to find and use a light grey for the toes and cuffs but after a year I couldn't wait any longer and decided that my skein of Regia Jeans Style Color will have to do. That, and I was really rushing to pack as we were heading to the mainland for Christmas and I basically threw any yarn that was nearby into a project bag before running out the door. I'm happy that I went with the Regia, though, I think the darker grey really makes the lighter colours pop. So far I'm loving the pattern and think it's a step up from plain vanilla. I do have to refer to the chart every second round to remind me exactly where I am and which colour to use to start the round, as my mind tends to wander...quite often. I also worry a lot about my tension and whether or not if I'm leaving long enough floats in the back. It's been a long time since I did colourwork last and so I feel quite rusty. From time to time I get paranoid that the socks will turn out wonky and unwearable. There have even been a few times where I was really tempted to rip back and start again because my tension looks tight in certain areas. And there's only so much blocking can do for that! It's all good though, I'm thoroughly enjoying everything that's on my needles right now and don't feel any urgent need to get everything finished immediately. It's such a pleasant break from the usual "gotta get this done NOW!!" feeling that I normally have. Let's just hope this break lasts for a while!! How do you knit socks? One at a time? Two at a time on oe long circular? Do tell! 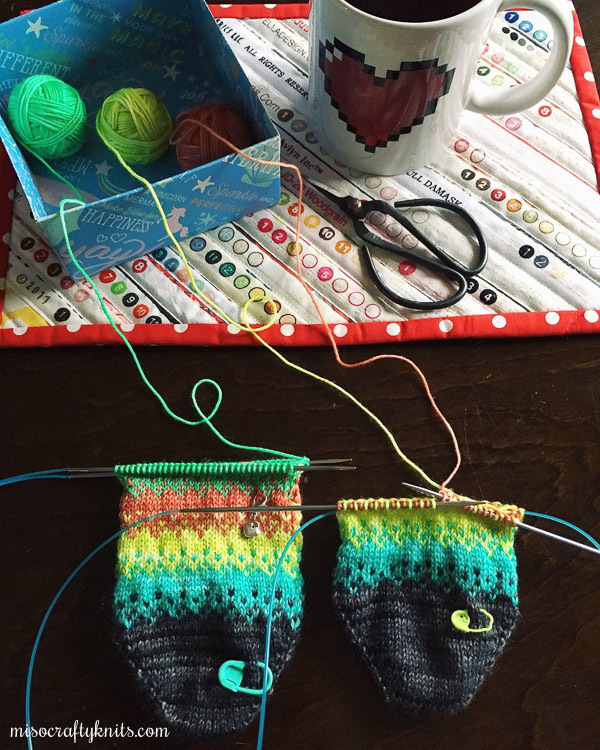 After my first pair of socks, I always knit them two-at-a-time on two 24" circular needles. I really like that my socks are finished at the same time, and that I don't have to remember what I've done on one sock, because I've already did whatever that was to the second sock - so they always match. For my first two-at-a-time socks I just pulled from the center as well as the outside of the ball and that got tangled up pretty quick. So now I've gotten into the groove of using my kitchen scale to divide sock hanks into two. I always thought that stranded work on socks was too much work, but that pixel pattern looks less daunting for some reason (plus super fun!). Can't wait to see what they look like when finished! I've always thought stranded work on socks was too much work too, but I'm finding it has more to do with tension than anything! I'm already a tight knitter and am finding that I knit even tighter when I knit continental when I hold one of the yarns in my left hand! I'll definitely have to work on that! Hello Susan! Thank you and welcome to my blog!